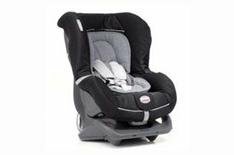 Britax First Class Si Ultra | What Car? A removable foam and material section provides good head support for newborns in group 0+ seat format. A deep section design means there's still good head support when your baby has outgrown group 0+ and you've turned the seat around to function as a group 1. There's also a smooth-acting recline mechanism with four positions. None of the early multi-group seats we're looking at here are particularly easy to use. Routing the seatbelt is difficult, it's tricky to get as good tension as you would on a single-group seat and adjusting the harness height is tough. You can get a reasonable discount off the recommended retail price by shopping around, but then you might be able to get two separate single-group seats for the same price - or cheaper. Some of the surface materials feel a little vulnerable to snagging, but the all-round quality is good. The padding and support for a newborn baby is especially good and will cocoon your baby as efficiently as many dedicated group 0/0+ designs can.